The perfect springtime sweet! 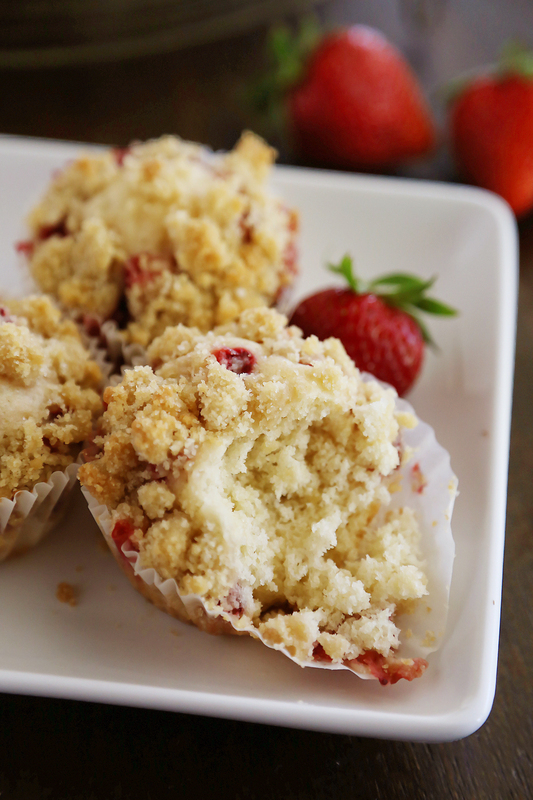 Bursting with fresh strawberries and topped with a buttery coffee cake crumble. Enjoy for breakfast, snacks, or even dessert (top with whipped cream or ice cream). In the springtime, I usually have no problem sticking to smaller portions… except when it comes to a coffee cake with fresh fruit! 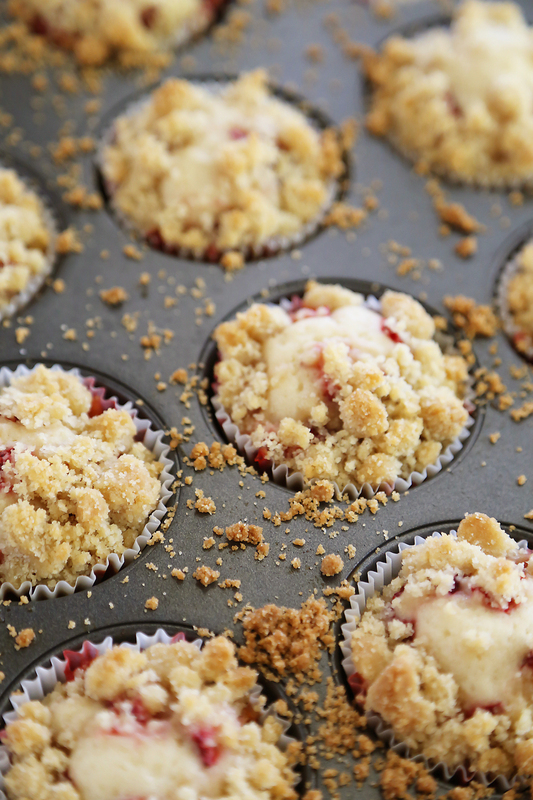 That buttery-sweet streusel, juicy berries and crumbly, soft muffin are enough to make my mouth water. So, since I think we can all agree ’tis the season to not be slicing ourselves a BIG ‘OLE slab of cake… I made everyone’s brunch favorite bite-sized. But, these beautiful treats don’t have to stop with brunch! Hungry for a midday snack? Want something sweet with lunch? Need a dessert for guests? These make the perfect little cakes served on a pretty plate with vanilla ice cream, or freshly whipped cream. I may or may not have baked these three times in the past two weeks. All in the name of the best recipe for you guys. And more coffee cake for my face. These mini coffee cakes are so fun to make, and only require wholesome ingredients like butter, sugar, flour, egg and vanilla. Plus, the best strawberries you can find! Simply mix up your dough and scoop 1 Tbsp. each into the cups of a 12-cup muffin tin. It may not look like much batter, but these babies really rise! 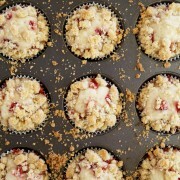 Top with chopped strawberries and sprinkle on your flour-butter-sugar (♥) streusel. Pop in your preheated oven for about 20 minutes, then remove and try to avoid picking off all the sizzling-hot buttery streusel bits. Savor the strawberry goodness with your morning coffee, as a midday snack, or after dinner treat. Preheat oven to 350 degrees F. Line a standard size 12-cup muffin tin with paper liners. Spray lightly with nonstick cooking spray. In a large mixing bowl with an electric mixer, cream butter and sugar until light and fluffy. Add egg and vanilla, beating until well blended. In a separate bowl, combine flour, baking powder and salt. Alternate adding flour mixture and milk to butter mixture, mixing well after each addition. Spoon 1 Tablespoon batter into each muffin liner. (It may not look like enough, but these really rise!) Top each muffin cup with chopped strawberries. In a separate bowl, combine all ingredients for crumble topping. Mix with your hands until pea-sized clumps have formed. Sprinkle crumble over strawberries. Bake muffins for 18-20 minutes, or until golden brown. Your post hit my e-mail and I opened it up and this huge strawberry and streusel crust looks so perfect and large on my screen. I wish I could just reach in and take a bite. 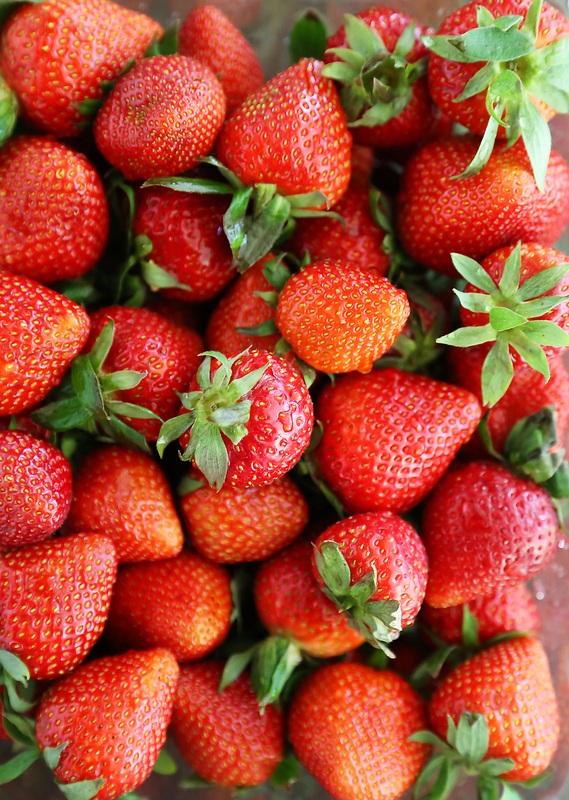 The strawberries are just gorgeous at the market and love anything with the crunchy topping. I can’t wait to try this recipe. Have a super weekend. These sound heavenly!! That crumb topping is perfection! Yum! I have to admit, crumbly topping is my favorite part. The rest looks great too! what a fun muffin! anything with coffee cake is my fave! I love coffee cake and make a LOT of them. I love muffins too. How clever to combine the two. What a GREAT breakfast. Where is the butter and my cup of coffee?????? I don’t normally talk about ME, but take note please of the slight name change from Wild Goose Tea. New web design too—whoopee and adding new features along the way. The crumb topping on these looks so delicious! These are right up my alley!!! I am all over these. They sound so yummy!! 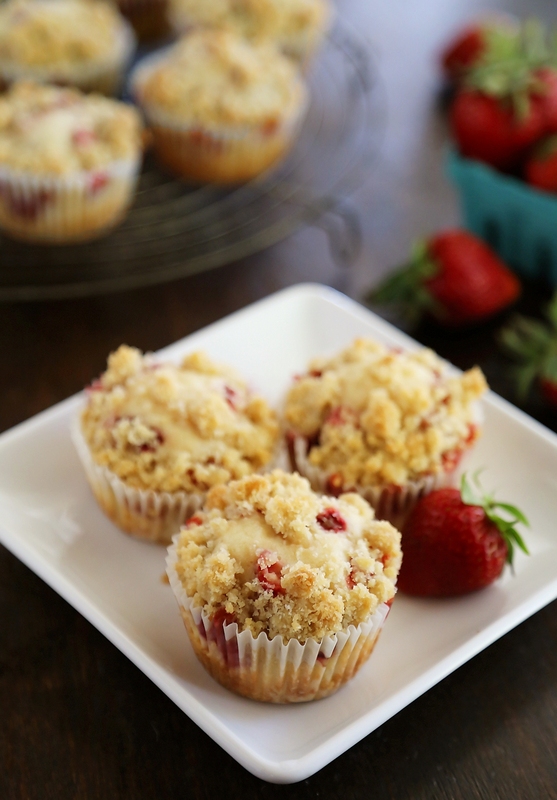 I can’t wait to try your streusel-y strawberry coffee cake muffins. These are worth getting up early for. I will let my wife make this coffee cake. It really looks yummy! i love that they’re muffin sized! Looks delicious! I like coffee cake muffins, I want to try this recipe, you can tell me, how much total time? I’d say these take about 15-20 minutes to prepare, and as noted, 18-20 minutes to bake. This looks awesome!!! I love a good muffin, cannot resist them! So I made these last night and they were awesome! Everyone loved them! 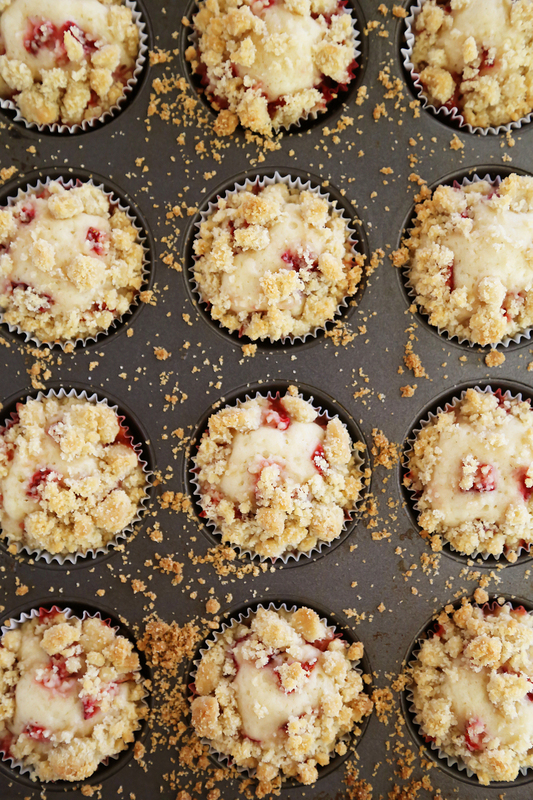 I was admittedly afraid of the tiny bit of batter covered in a layer strawberries and crumble, but I listened and assembled as directed, and you’re right the muffins grew and enveloped the strawberry bits perfectly! Thanks for the great recipe, its going in my recipe box! Anyone make these as mini muffins??? I like to make delicious treats for fellowship after church and reg sized muffins are too big. These should work fine as mini muffins – just put a very small amount of batter in the muffin cups (about 1 teaspoon should do it). I surprise how a lot attempt you set to make this kind of fantastic informative site.